The Kashmiri region of India is known for the abundance of meat in its cuisine; this dish is meat-free but still incredibly satisfying. 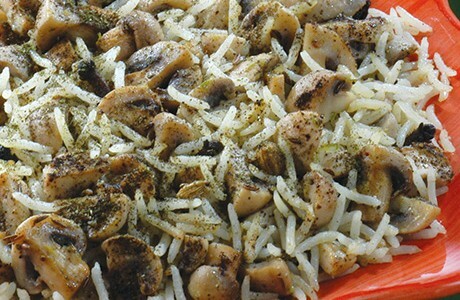 Mushrooms, cooked in cardamoms, cloves, cinnamon sticks and garlic, allow for an incredible depth of flavour. Boil the mushrooms in water for 5-7 minutes. Drain and wash in cold water. Put the washed mushrooms in a pan and add the oil, onion paste, green and black cardamoms, cloves, cinnamon sticks, salt, and garlic. Put the pan on heat and mix well. Stir and cook for 5 minutes until the mushrooms are light brown in colour. Add the cooked yoghurt and continue to cook until the oil separates. Add 800ml of water, the dry ginger powder and coriander powder, and then stir well. Add the drained rice, and stir again. Bring to the boil, reduce heat and simmer for 10 minutes until the rice is done. Garnish with black cumin seeds, black pepper powder, and dry mint leaves and serve.